A Biblical Model For Single-Parent Families The prophets Elijah and Elisha seem to have had a special ministry to single-parent families (1 Ki. 17:7-24; 2 Ki. 4:1-7). Accounts of both men’s ministries include situations that involve single-parent families in distress, thereby affirming both the difficult lives of such families and emphasizing God’s provision for their needs. Indeed, the two prophets could be construed as history’s first family therapists with a specialization in treating single-parent families. Let’s look at one of their cases as an explicit portrayal of how a single-parent family can become an effective family unit. Second Kings 4:1-7 details the account of a widow and her sons who were left financially destitute when their primary provider died. This circumstance is similar to that faced by single parents in our society today who are left to lead families when the other parent leaves the family home via divorce. It is not uncommon for these families to have difficulty making ends meet, and since most single-parent families are headed by women, this case is appropriate. In it the man who died made no provision for his wife and children, and upon his death they were indebted to such an extent that she was in jeopardy of losing her sons to the creditors who would make them slaves (2 Ki. 4:1). However, this woman did have a resource she could turn to, and that was the man of God, Elisha. Prompted by her distress she turned to him and asked for help. She was in dire financial straits, which is nothing new for single parents especially when their exspouse does not pay the alimony or child support. Her situation was so desperate that she was about to lose her sons to slavery, but she did have faith that prompted her to turn to the prophet. Elisha’s response to her dilemma and her response to his intervention epitomize key elements of functional single-parent families. Elisha’s first question is critical to our seeing the value of this application. He asked, “What do you have in your house?” (4:2). This question made her realize that although her resources were limited they were not totally gone. Her reply was, “your servant has nothing there at all … except a little olive oil” (4:2). By asking that question, Elisha directed her to think about what she still had rather than what she had lost. She was faced with a choice. She could focus on and bemoan her lost resources (the pity pot) or focus on the resources she still possessed (the pot of oil). She could feel sorry for herself and berate her circumstances, or she could do something to help herself. When she identified her resource, Elisha then directed her to an action plan which demonstrated how single-parent families can operate effectively. First, Elisha instructed her to ask for help. She was to ask her neighbors for empty jars. notice the details and implications of this directive. She was to ask for help, which is often difficult for single parents to do. She was told to be bold about her request. He said: “Go around and ask all your neighbors for empty jars. don’t ask for just a few” (4:3). She was to ask her neighbors to provide resources so she could help herself, rather than ask them to do something for her. She was to make use of adult resources outside the family, not expect all those resources to come from her children. Second, Elisha directed her to use the resources acquired outside the family to mobilize her family to action: “Go inside and shut the door behind you and your sons” (4:4). The implications here are also important. She was to mobilize the resources she had received inside the family unit to work together to help themselves. This acknowledges the fact that in single- parent families children are expected to do more and the parent needs to learn how to delegate rather than do everything for the children. All the members of the single-parent family need to reorganize around the task of helping themselves. They are to use their resources to the fullest extent: “Pour the oil into all the jars” (4:4). Third, God’s grace was an integral part of Elisha’s action plan. The oil kept flowing until all the jars were filled. notice the functioning of the family in the description of their response. The mother did as she was instructed and followed Elisha’s action plan: “She left him and afterward shut the door behind her and her sons” (4:5). She and her sons worked together heartily: “They brought the jars to her and she kept pouring” (4:5). When all the jars were full, the oil stopped flowing. We might say that this single-parent family and God rested after their work was done, and before proceeding to the next step. Fourth, the woman continued to seek God’s direction by returning to the man of God to inquire about the next step; he directed her to sell the oil, pay her debts and live on the rest (4:7). notice the allsufficiency of God’s grace. The action plan involved a family business that produced income that not only solved their immediate problems, but also propelled them to a productive and self-sufficient lifestyle. Consequently, the original crisis (debt and lack of resources) turned the family to God, the ultimate resource, who in turn provided resources both from outside and inside the family so that the parent and children were not only preserved but thrived. That is the essence of successful single-parenting. 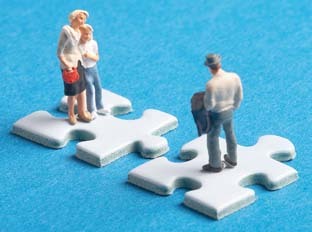 In spite of all that has been noted, the most important question for the single-parent family remains: “Aren’t single-parent families really less than two-parent families?” The inferiority complex – derived from the concept that real families have two parents – continues to haunt single parents and their children. labels like “broken home” cast a stigma on single-parent families that is hard to overcome. efforts to change this negative attitude are making headway among Christians who remember that Jesus likely spent most of his growing-up years in a single-parent family. But progress is slow. Recent research supports the idea that children can not only adjust to single-parent families, but can do quite well in post-divorce families where one parent is present. One study that addressed post-divorce adjustment of children reported that 1/3 did really well, 1/3 functioned adequately and 1/3 demonstrated poor adjustment, based on the criteria used. However, when compared to children living in distressed two-parent homes, all scored higher on all levels of functioning. Single-parent families can function effectively, and the fact that Scripture provides poignant illustrations only confirms God’s availability to, His involvement in, and His valuing of the singleparent family.